To share a printer, select the check box next to the desired printer and click the Add button to select which users will have access to the shared printer. (By default, a shared printer can be accessed by everyone.) To prevent someone from printing, click that user’s entry in the list and click the Delete button (look for the minus sign). Voilà! You’re the guru! Hey, what about your firewall? 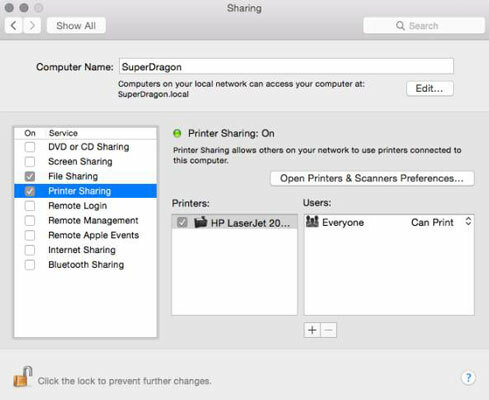 Remember, you’re using Yosemite, and everything is set automatically for you the moment you click the Printer Sharing check box! Yosemite automatically opens the correct port in your firewall to allow printer sharing. (And, yes, if you decide not to share your printers and you deselect the Printer Sharing check box later, Yosemite cleans up after you. It closes the port in your firewall for you.) Sweet. The printers that you specify are available to other computers in the same IP subnet. In other words, someone in your local network can use your printers, but no one outside your network has access. If you haven’t already assigned a printer a descriptive name, open System Preferences and click the Printers & Scanners icon. Click the desired printer from the list in the Printers & Scanners pane and then click the Options & Supplies button. Click the General button on the sheet that appears and enter a descriptive name in the Name text field. You can also identify that printer’s location in the Location text field. If you share printers, don’t be surprised if your Mac seems to slow down slightly from time to time. This is because of the processing time necessary for your Mac to store queued documents from other computers. The hard drive activity on your Mac is likely to significantly increase as well.